At long last, the recession-doomed site of the high-rise condo complex known as Park Fifth is seeing some action. 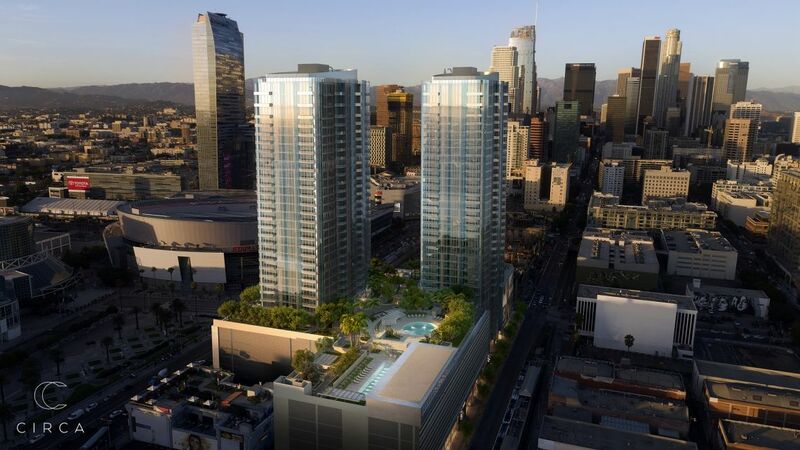 This particular patch of ground, across the street from Pershing Square near downtown Los Angeles, has been the subject of a tug-of-war between would-be investors and market forces for at least seven years. Park Fifth, a pair of 76- and 41-story towers designed by Kohn Pedersen Fox, went down with the real estate bubble in 2008. Even the current project, dubbed 5-OH, has seen a lot of uncertainty during its relatively short life. “We went through a lot of studies and a lot of different client groups,” said Harley Ellis Devereaux’s Daniel Gehman. “[There were] a lot of shifting sands.” Today things look more certain. MacFarlane Partners bought the site in October of last year, and are moving ahead with a pair of residential towers Gehman estimates will cost (very roughly) $260 million. 5-OH has already cruised through its zoning administrator hearing. If all goes well, construction crews will break ground in early 2015. 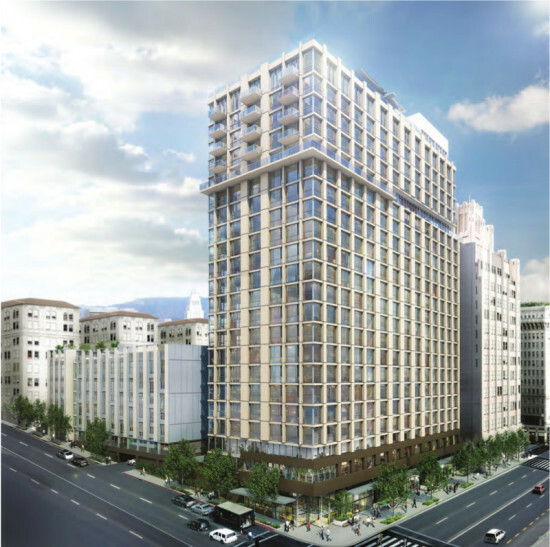 Though smaller than Park Fifth would have been, 5-OH’s 615 residential units—split between a 24-story high-rise and its seven-story companion—dwarf what earlier plans envisioned. 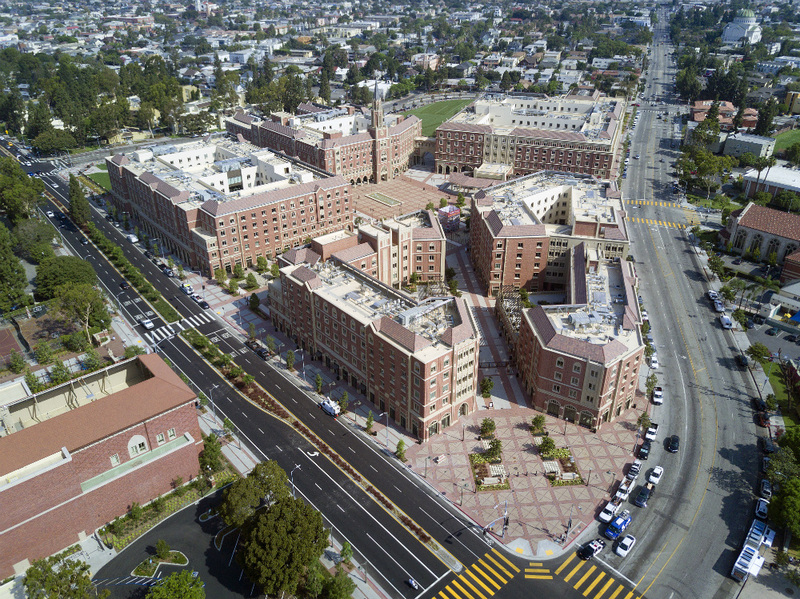 Several previous clients “tried to get it approved as a seven-story building, [but] it became evident in working with the council office that that wasn’t going to fly,” said Gehman. Harley Ellis Deveraux looked at the site and found that “there was a very evident place to put a tower.” From there, said Gehman, the high-rise practically planned itself, with the space in back reserved for the smaller building. In terms of aesthetics, the architects had two options. They could design a contemporary complex within the strict parameters of downtown design guidelines. Or they could draw on the existing historic building stock for inspiration. “We decided to be as contextual as possible,” Gehman explained. “We wanted the buildings to feel like they’re playing nice with their neighbors rather than getting into their face.” On its street sides, the mid-rise is clad in cement-fiber and metal panels. In the courtyards, the architects opted for plaster and other traditional residential materials. The courtyard balconies’ metal railings mimic the fire escapes of the older buildings nearby. The 24-story tower is much more glassy, but in a way that pays homage to its neighbors, particularly the Title Guarantee Building. “There’s a motif of trying to get the windows to look like they’re recessed in a thicker wall. It’s not a glass box, but glass strategically placed,” said Gehman. The cream-colored panelized metal skin creates “sort of abstracted traditional forms rendered in contemporary materials.” A community room and pool deck on top of the taller structure will provide views of both the historic core and the taller contemporary towers to the west. “One of the reasons I like the site so much is it’s extremely transit-rich,” said Gehman. There are bus stops at every corner, plus the Pershing Square subway stop within a stone’s throw. “It would be very, very easy to reduce auto dependency if you lived on the site,” Gehman concluded.